It's two days after Christmas and only now have I had enough time to write about it. We were busy seeing family on both sides over the past three days. On Christmas Eve we went over to Gram's and Papa's house for the family Christmas. Alyce and Luke both had a great time running around the house and playing with their cousins. 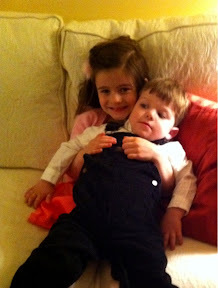 Luke found a good friend in his cousin Isabella. She took to him the second he walked in the door and he was more than happy to sit in her lap and give her lots of hugs. Alyce enjoyed dancing to all of the Christmas songs being sung by her family and played on her cousin Augostino's guitar. 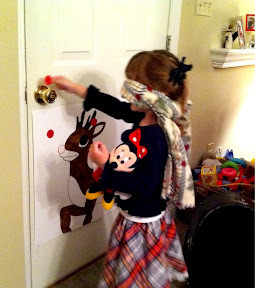 Following dinner that the kids couldn't be bothered to eat the kids played the game Pin the Nose on Rudolf. Mom made the game for the Holiday Party at Alyce's school however she fell ill and missed that day. Rather than let it go to waste the kids played. Luke even got a chance to play however he didn't use the blindfold. When finished the kids asked what had they won? The answer, they got to open presents! 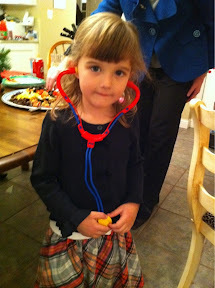 Alyce's favorite present opened was a doctor kit that has light up instruments. Luke liked a set of books and a play power drill. Both kids did great all night. Mom's cousins all have kids our kids ages and aren't afraid to step in when needed. We do the same and this allows everyone to let their guard down and have a decent conversation as you can rely on each other to keep your kids from getting into major trouble. The first night was down with two more to go. 0 comments on "Christmas Day 1"